It was our fundraising dinner and I was trying to explain to a packed Dartington Great Hall, that LandWorks is a team, a great team, not just staff, volunteers and supporters but the guys themselves. We often become a sort of family… important to one another. Nick Hardwick (HMP Chief Inspector) had just wooed the crowd as he eloquently explained just what LandWorks is all about… “Discovering treasure”. Building relationships, individual personal relationships. I could hear myself speaking but part of me wasn’t there… an earlier phone conversation from HMP had detailed a new Prison Order that, in effect, immediately removed three prisoners from LandWorks. I am sure you can understand, part of me was with them. The fundraiser has been months of careful planning, producing a most fantastic evening. Then gone, overnight, gone. Ripped away, a sudden change in the rules from the MoJ, a sanction that decreed risk levels too high. A decision made with no knowledge about those it will affect, a potential massive set back to a carefully planned resettlement. There is a real sense of loss, certainly emotion and grief. The dinner raised a truly staggering £14,000. There was a great atmosphere that night, many people coming together to support us but also bringing new people to learn about LandWorks. Genuine interest, concern and I felt people wanted information to be able to form an opinion on how we all deal with resettlement – a good community. Nick Hardwick, during his speech, brilliantly conjured up images of life inside prison, prisoners moved indiscriminately around the system. We’ve seen it happen before at LandWorks and I am sure we will see it happen again. But bloody hell it’s hard. They are good men and we all have lost. I have now managed to talk to them and two men will come back to finish their resettlement once released. New trainees will now join our remaining gang. If we had needed a story to reinforce both the Chief Inspector’s and Judge Cottle’s speeches on prison difficulties and resettlement, this was it… at the time, played out behind the scenes. 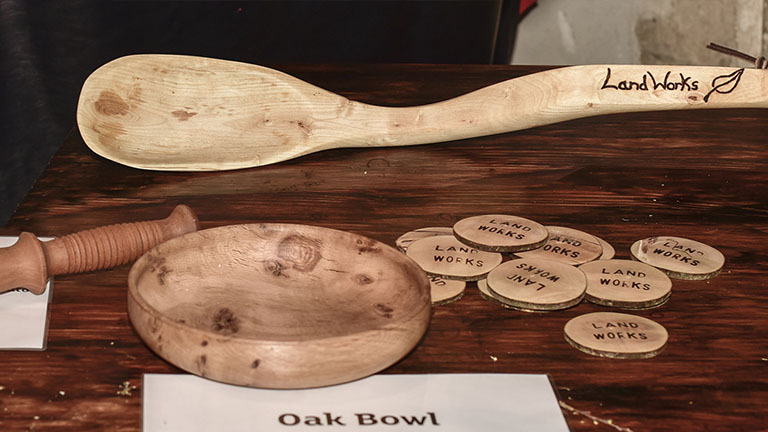 The same guys who made some of the raffle prizes were now gone; one a beautiful enormous wooden spoon that fittingly and with no possible knowledge of the unfolding HMP events…had became the star auction prize.